Cat’s pajamas, doodley-doo. Kitties on the prowl, two by two! This rhythmic book of hip cats, cool cats, and all kinds of other cats is a hand-clapping good read that’s ideal for children ages one and up. 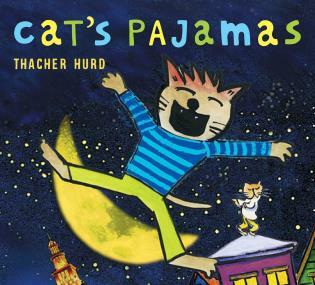 Thacher Hurd is the author and illustrator of many books for children, including Mama Don't Allow, Art Dog, and Mystery on the Docks. Among many other honors, he has received a Boston Globe-Horn Book Award (for Mama Don’t Allow, 1985) and a New York Times Best Illustrated Award (for Zoom City, 1998). He lives in Berkeley, California. Boasts a rhythmic, hand-clapping text and inventive illustrations.